“Hey! After much research on the internet, I think we’ve figured out that the skull from the juniper bush was a rabbit! I think it was the Easter bunny!” I said loudly to my in-laws on Sunday. “Well, better than Santa Claus,” my mother-in-law retorted. She’s referencing my childhood that was void of all things Santa, but seriously, yes, a human skeleton of any type, let alone the jolly old elf himself, showing up in my backyard would be creepy as hell. Especially since we know that one of the owners DIED in our house. She was old, though, and not related to Santa in any way. So, short of having some human burial ground in our backyard, coming across an animal skeleton was a step better. Though, typically, dead animals freak me out. I mean, really freak me out. Like I have a 6th sense for taxideried mounts and have yet to be disproven by my proclamation “there’s dead animals here.” Usually Boof looks at me like I’m crazy, but then sure enough the person’s house or the antique shop or the random restuarant will, in fact, have some type of taxidermied animal on display (or chucked in a bin with antique dolls and old shoes), and I will proudly exclaim “told you so,” to my scoffers. I’m pretty sure I was the only child who listed “dead buffalo” as a fear. Not live buffalo. Dead buffalo (who, coincidentally I believed haunted our hallways, though taxidermied animals had never ‘set foot’ in our house). So, coming across a skull, in my backyard would normally leave me screaming or crying or feeling a sort of panicky-can’t-get-my-breath moment. For some reason, maybe wanting to be strong for my toddling son, I became fascinated. 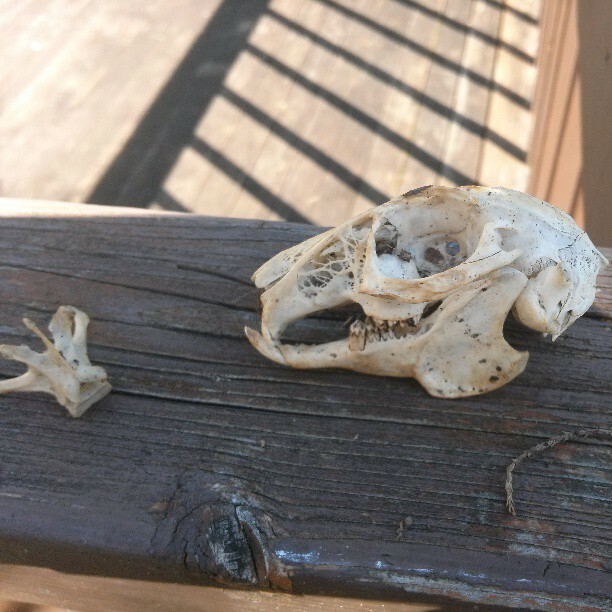 And I pulled the skull out of the pile of decaying juniper needles, dug around and found a few more bones, and placed it on our deck to research later. Because, it makes a difference, right, if it was a large rat (Boof’s first guess) or a gopher (my guess) or…The Easter Bunny. I wasn’t allowed to believe in Santa Claus as a kid because my mom’s parents had let her believe until she was about 12. And then she thought they were liars and then she had a crisis of faith wondering if GOD existed because she couldn’t see Him and maybe he was just like Santa and the whole thing was a sham. Boof, on the other hand, has fond memories of the Santa presents and the whol rigamarole that surrounded it as a kid. It might cause us to get a divorce because I am staunchly anti-Santa and he is marginally pro-Santa, but my in-laws feel judged and sad that I am so anti-the-whole-thing. They also say I’m a hypocrite (in not such nasty words) because I’m fine with believing in mermaids and fairies and the Easter Bunny. And they don’t understand why my parents encouraged Easter Bunny and Tooth Fairy beliefs but were so staunchly anti-Santa. At any rate, after much googling, it appears the skull is more on par with a rabbit than a rat (phew) or gopher (meh). My mind begins to wonder, though, if the rabbit lived in our backyard and died of old age? Or did he get scared and find shelter under the junipe bush and then it MURDERED him with its insidious juniperyness? Or maybe it was injured and suffered because of a dog-bite and died a mere few feet from where help could have potentially saved it. Or maybe it was so outraged by the Cadbur Egg prices this year that it had a heart attack. I’ll never know the true story, but…what if? What if it was the death of the Easter Bunny? What if my backyard is a burial ground for other things, too? Eek!